IARC is part of a multi-year effort led by CW3E’s Director F. Martin Ralph, Mike Dettinger of USGS and David Lavers of ECMWF to foster collaboration and exchange of ideas on atmospheric rivers (AR). 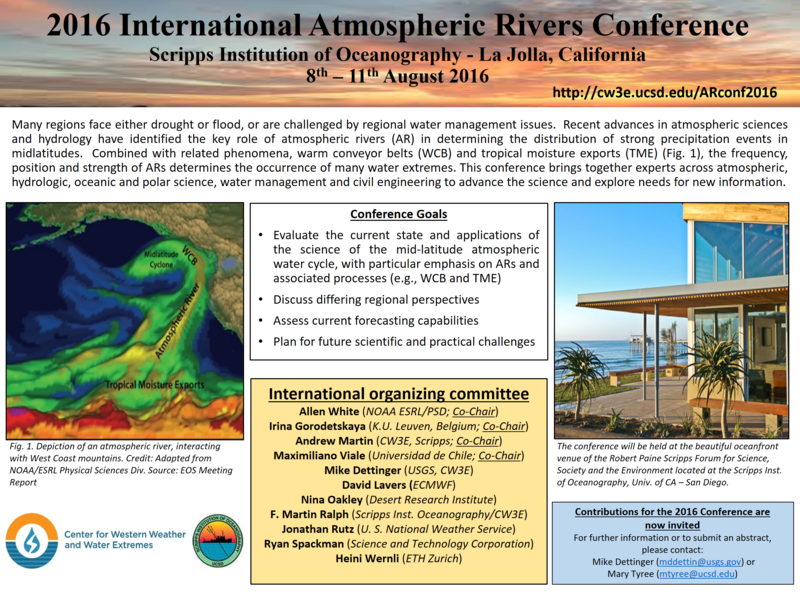 2) an atmospheric river focused conference should be organized. The second event in this 3-year effort is the 2016 IARC conference held from 8-11 August (described below; agenda). The third event is a summer colloquium intended for summer 2017 at Scripps. It is intended to bring together at Scripps authors of the AR Monograph Book Chapters and graduate students from around the world for roughly 3 weeks of lectures and mentored mini-research efforts. Woven through this series of events over 3 years is the development of the AR Monograph, which has been funded by a grant, including publication by University of California Press. IARC brings together most of the Chapter authors, at a point in the writing where new ideas garnered during the conference can be incorporated into the Monograph. The goal is then to have the Monograph finalized and in print for the AR Summer Colloquium. A technical editor, Lauren Muscatine (and her experienced team from UC Davis), is supporting preparation of the Monograph.